With some trepidation, i wanted to develop a narrative around the current conversation on gun control in America, in the context of the recent tragedy in Florida, and the emergence of a group of young survivors calling for change. I’m writing this not to advocate any particular change, but rather to build a case study of what we are seeing play out, in terms, specifically, of storytelling, and power, and how this conversation is only possible because of the structural shifts in narrative in the Social Age. Perhaps we can consider two narratives: one is a dominant, existing one (the right to carry arms, the NRA etc), and the other is an emergent narrative (survivor stories, aggregated social unrest, children speaking to the camera, demanding change). There is an interesting feature around narratives that we have seen playing out recently around the #MeToo movement at the Golden Globes: the dominant cultural grammar of ‘celebration’ was to wear bright and colourful dresses, but at the Globes, the #MeToo movement called for women to wear black. Most, but not all, did. This was a successful adoption of a new dominant narrative, at scale, at speed, something which is remarkably hard to achieve. But an interesting effect was felt by the few women who chose not to conform, who still wore colour. Whilst they had not changed at all, they found themselves swept into a space of opposition or dissent, despite not moving. The choice not to conform with, adhere to, the new dominant cultural narrative left them holding onto what was now an old one. This is fascinating, because everything about the ecosystem of the Social Age mitigates for socially amplified storytelling, and aggregated social response, at scale. Stories and conformity can spread far and fast, especially if deemed authentic. Indeed, ‘authenticity’ is frequently named as the top trait that people look for in Social Leaders. Look at this narrative play out: a hundred survivors take a seven hour bus trip to meet State legislators. They are young, they have a deeply tragic and authentic story, and they are angry and articulate. Facing them are largely a group of old men, with an established, dominant, narrative, representing mainstream commerce and the iconic narrative of the Wild West. The new magnetism of youth, authenticity, and righteous anger may burn through this like a flame through ice. The grounding of established gun ownership is law, but grounding authenticity of the emergent narrative is youth, and relevance. And it’s powered by collectivism at scale: young survivors from different terrible events can collectivise around a shared oppositional story. I’ve become quite fascinated by the power of oppositional stories: stories of consensus grow around a shared vision of a future state, whilst stories of opposition simply grow in opposition to the current state. Historically, the consensus narrative has held firm, around gun ownership, and the link to civil liberty, rooted in the Constitution. But #MeToo has taught us how rapidly dominant narratives can crumble, given the right form of social fury, authenticity, and indignant anger. I think we could easily see the new consensus in opposition gain great speed. But will it be diffused, or made safe, through tinkering on the edges? I’m less sure. The problem there is that if you e.g. ban bump stocks, the devices that let rifles shoot ever faster, you only satisfy part of the audience, so you end up still facing an aggregated oppositional narrative. Can you hive enough off the edges to satisfy the crowd? Possibly, today, but what about amplification effects? The sad truth is that established power cannot dispute, deny, or disrupt, the authentic voice of children who survived. And history teaches us that sooner, not later, their ranks will be swelled by more young survivors. And each new survivor will build on the emergent narrative. I’m not naive about social movements: #TakeAKnee has not rebalanced social injustice in the States, and #MeToo has not yet bought established systems to their knees. But they are not done yet. And at some point, a dominant narrative largely owned by a subset of the community, and held in financial influence and power, will be highly vulnerable to the authentic story of survivors. I think we will see change. The system may manage to stabilise this round, but i doubt it can stabilise it forever. Time will work in favour of the children. 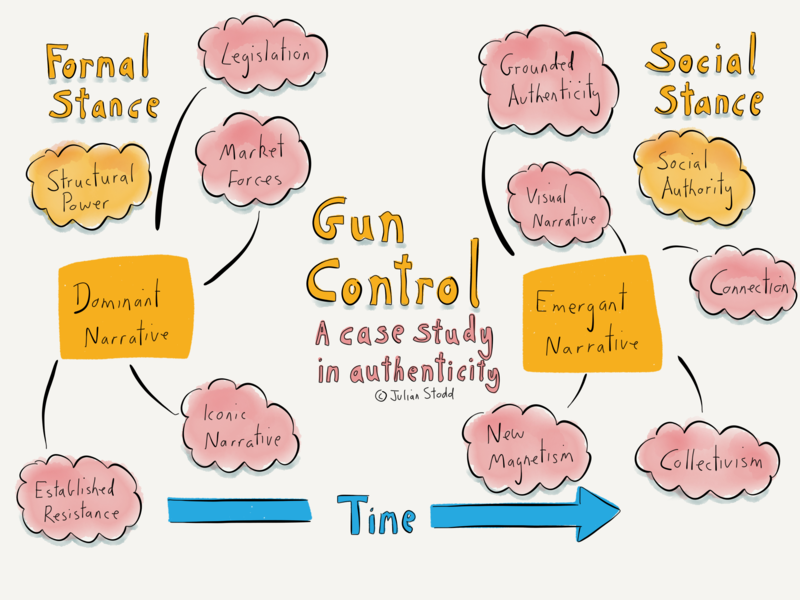 This entry was posted in Change and tagged Authenticity, Change, Gun Control, Narrative, storytelling. Bookmark the permalink. If you ve not seen it and get the chance, go and see Julius Caesar which is currently playing at the Bridge Theatre in London. Get a ticket for the Pit not the seats so you will be an active part of the people/mob.